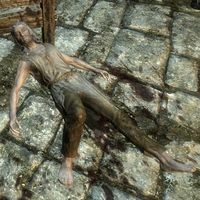 Nords are unnamed and deceased Nords scattered around Skyrim. These Nords are all male farmers and wear randomly determined clothes (7 variations), boots (4 variations), with a 50% chance for a hat (3 variations). Additionally there is a slim chance they may carry a lockpick and a small amount of gold. These Nords are all female farmers and wear randomly determined clothes (7 variations), boots (4 variations), with a 50% chance for a hat (3 variations). Additionally there is a slim chance they may carry a lockpick and a small amount of gold. These Nords are all male farmers, but slightly different, as they are older and wear ragged robes. They all carry a leveled necklace. 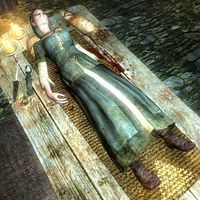 If Dawnguard is installed, another dead Nord will be added to the game. 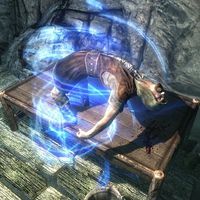 This elderly male Nord lies on a blood-splattered table in the chamber of Redwater Den where two death hounds are caged. He wears ragged robes, and carries no items. During your travels, you may encounter a living female Nord who taunts you. See the Taunting Adventurer page for details. 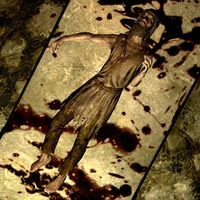 Inside Broken Helm Hollow you will find a dead Nord. His real name is Leifnarr and was named 'Nord' due to a developer oversight. One additional Nord, a living Berserker with base ID 00103502, should have been included in a random world encounter. Two more lie dead in the rocky, forested area of OLDBluePalaceWing01. This cell was unused in the game, but could have been a different version of The Mind of a Madman. This page was last modified on 27 January 2016, at 22:30.